I have lots of news and pictures to show you this week, but first, one last reminder that THIS SATURDAY is the third annual WillaMutt Strut! You can still come, even if you have not yet registered. In fact, you can register on Saturday morning! The weather is supposed to be good, and I just got the itinerary for the morning. Registration begins at 8:00 a.m. at the Riverfront Park North Pavilion. 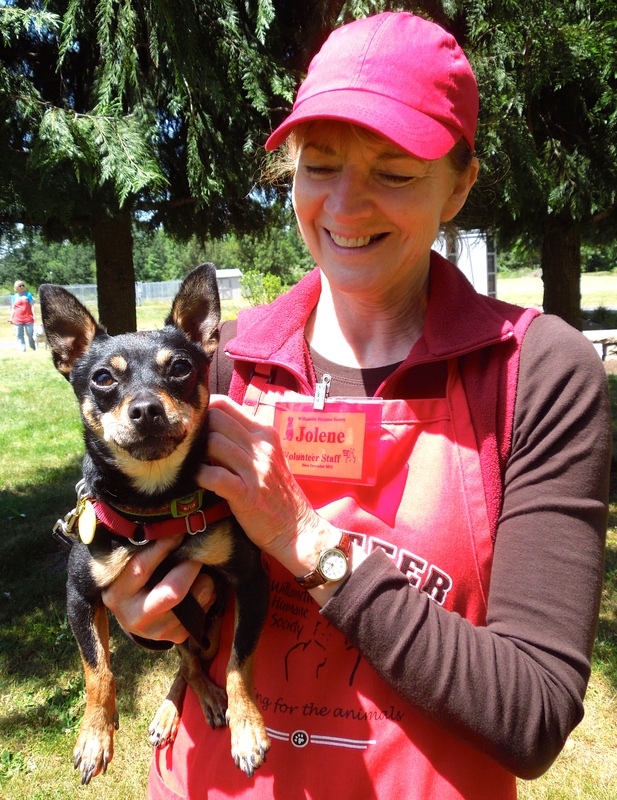 There will be dog games, Flyball demonstrations, dog trick contests, the WillaMutt Contest (for the WillaMutt of the year! ), and, of course, the 5K Run, 1.5K Run, 5K and 1.5K Walks. There will also be a meet and greet with a K-9 Police dog and handler as well as a demonstration. It promises to be the best WillaMutt Strut morning EVER! Don’t miss it! 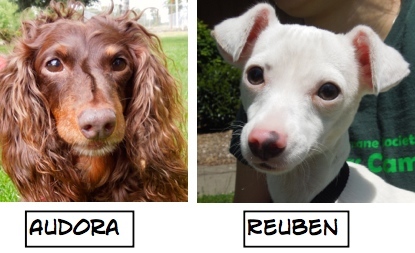 There were some wonderful dog adoptions this week, including three long-termers! 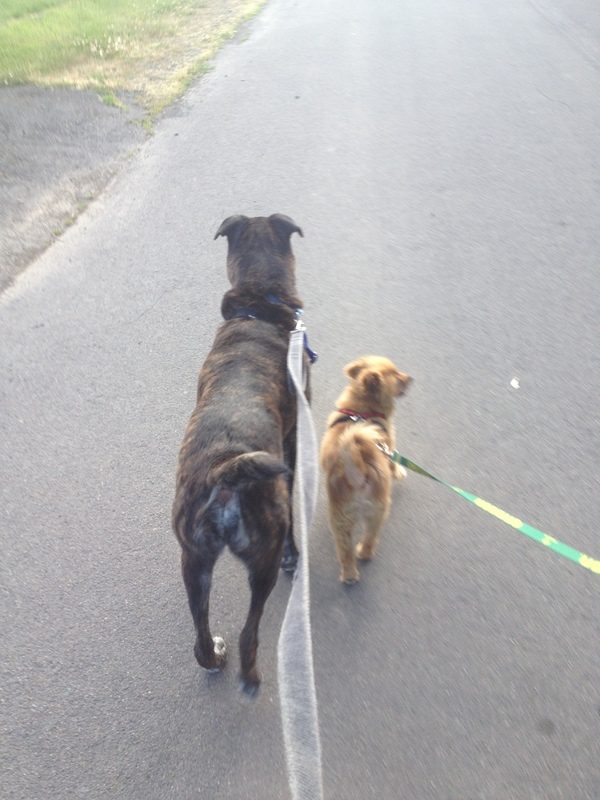 Here are the Blog Dogs who are now happily enjoying life in their new homes. As I explained last week, I won’t be able to attend play group for awhile, but I did arrive at WHS a few minutes before it ended and got a couple of shots. Thelma had played hard and was thoughtful as she was resting. 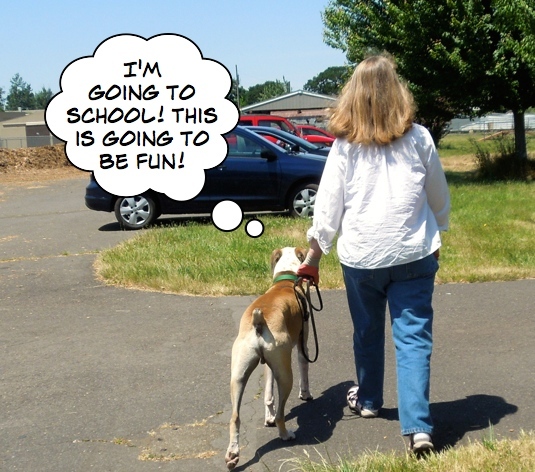 And Spitzer was enjoying seeing over into the big-dog yard with Kim’s help. Later on Sunday, Jolene brought Spitzer out. 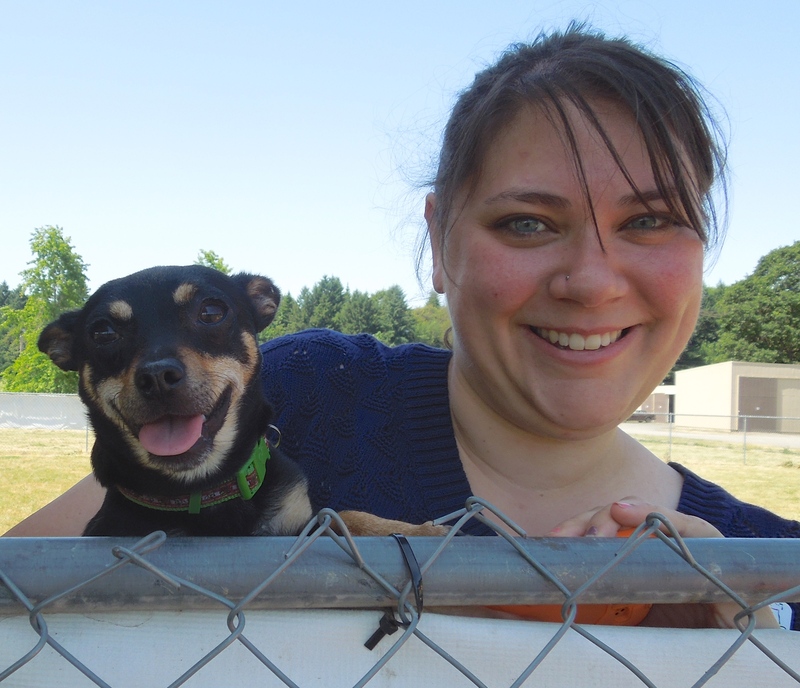 He is a four-year-old Miniature Pinscher/Chihuahua mix. 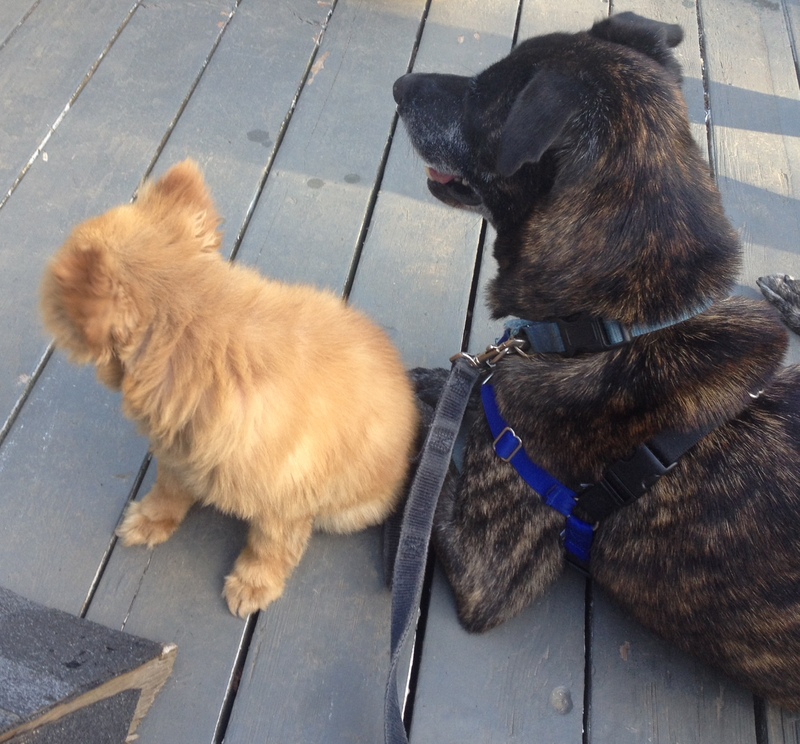 He gets along with other dogs, cats, and even chickens! 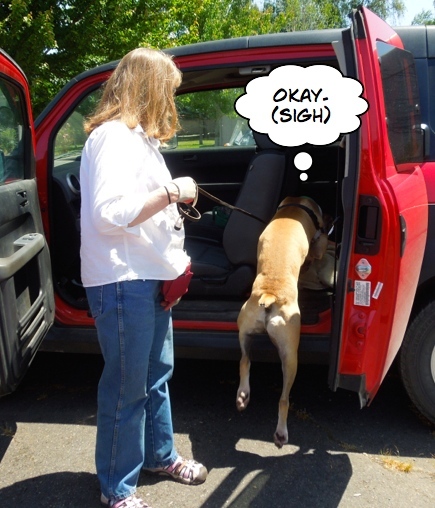 He is mostly house-trained, but needs to be on a regular schedule to minimize accidents. 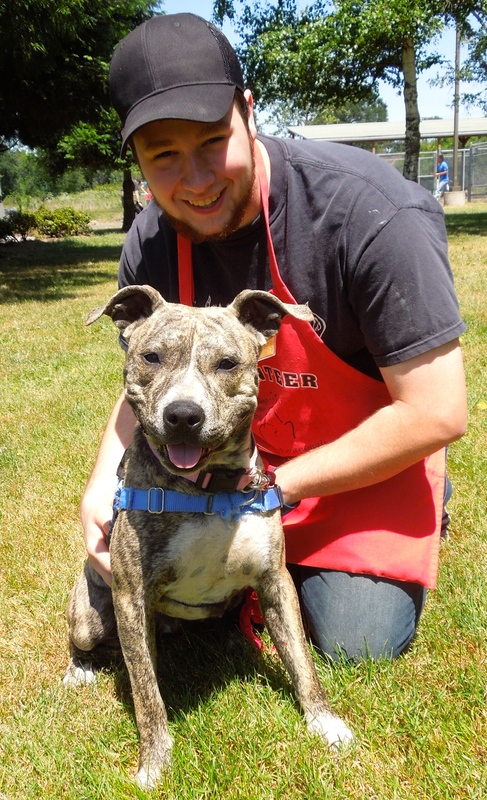 Though Spitzer loves people, he doesn’t like to be over handled, so would need to be in a family with older kids or just adults. He is even crate-trained! He’ll make a great little friend for the right family. The first dog I saw being walked on Sunday afternoon was also one of my favorites, Rodeo. 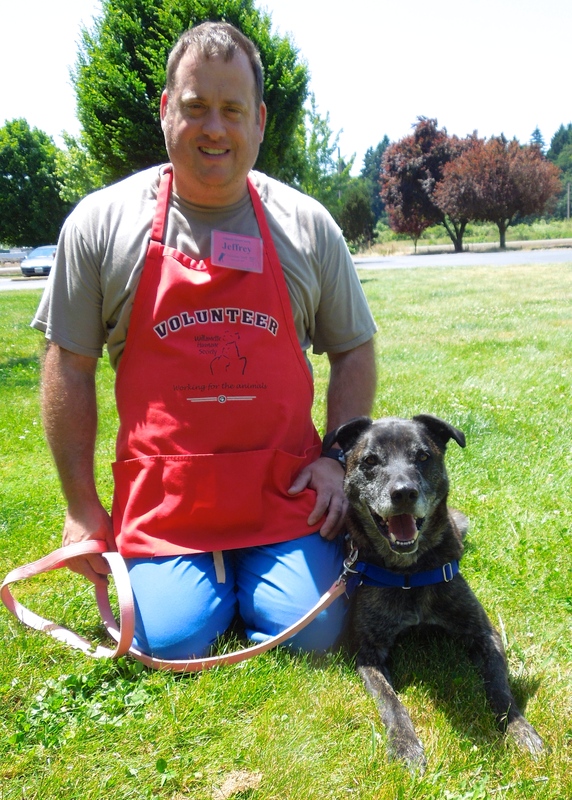 Jeff was enjoying spending time with this terrific and long-overlooked dog. 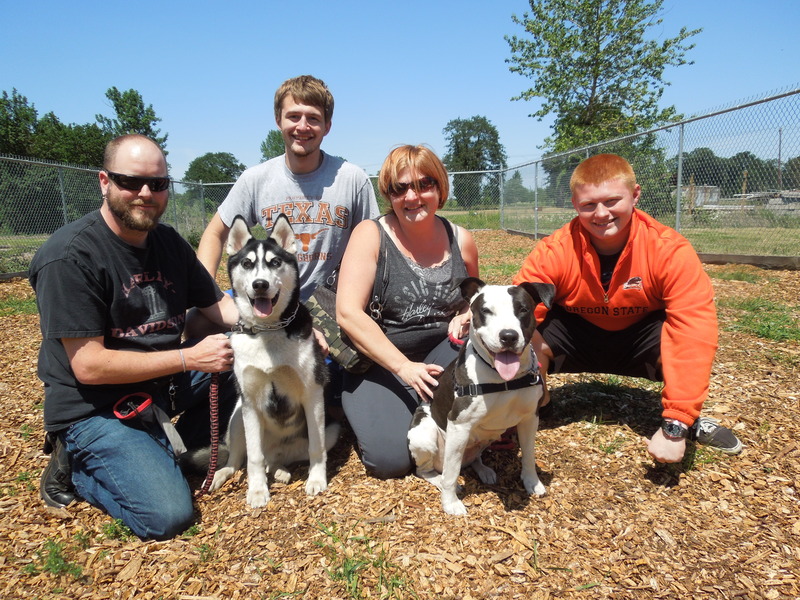 Rodeo has been hoping for a new family since March 31st. 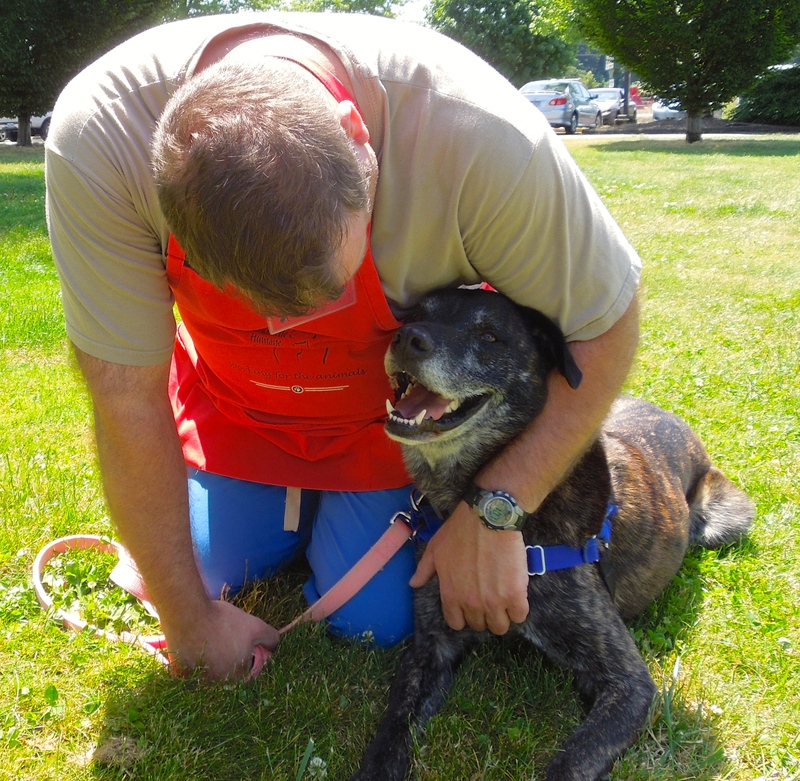 He is a seven-year-old Shepherd mix who is a gem. 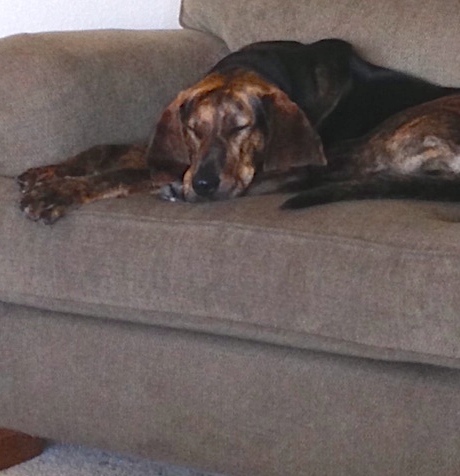 He has been anxiously waiting to start a new life with a forever family, but none has yet come. Maybe THIS week? 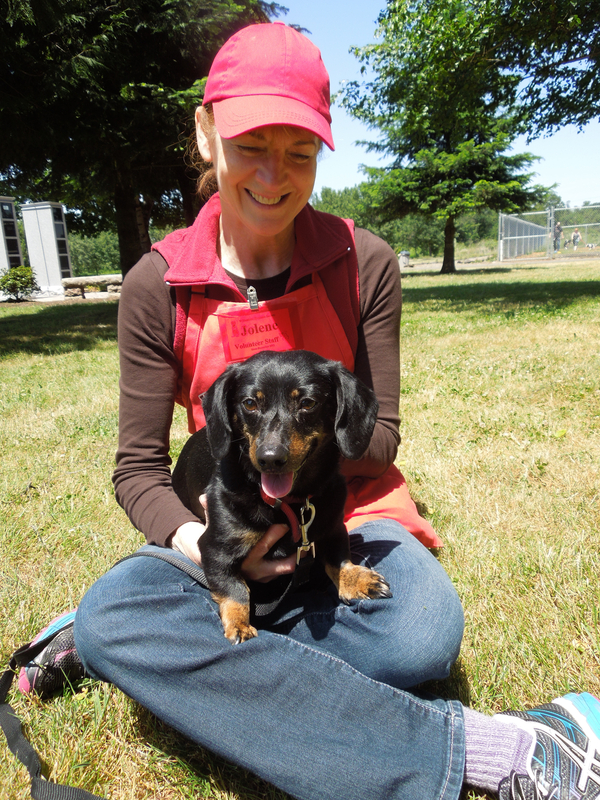 Rodeo has become a favorite of many volunteers, one of whom decided to take the boy on a much-needed respite last week. 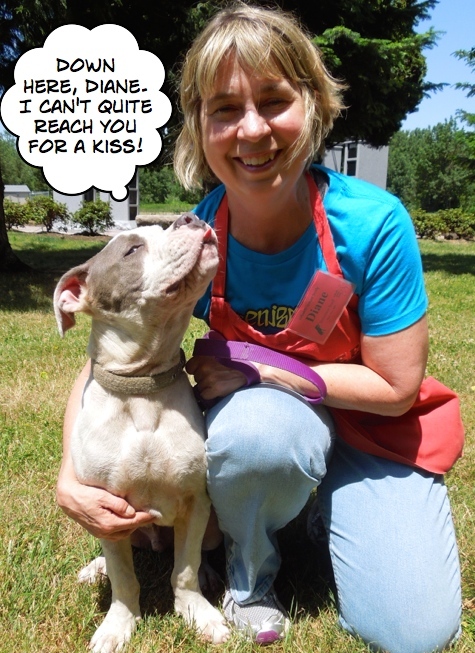 Here is a note that Kim, our Adoption Lead, got from the volunteer afterward. Of course I had to get more pictures of sweet Roxy on Sunday. 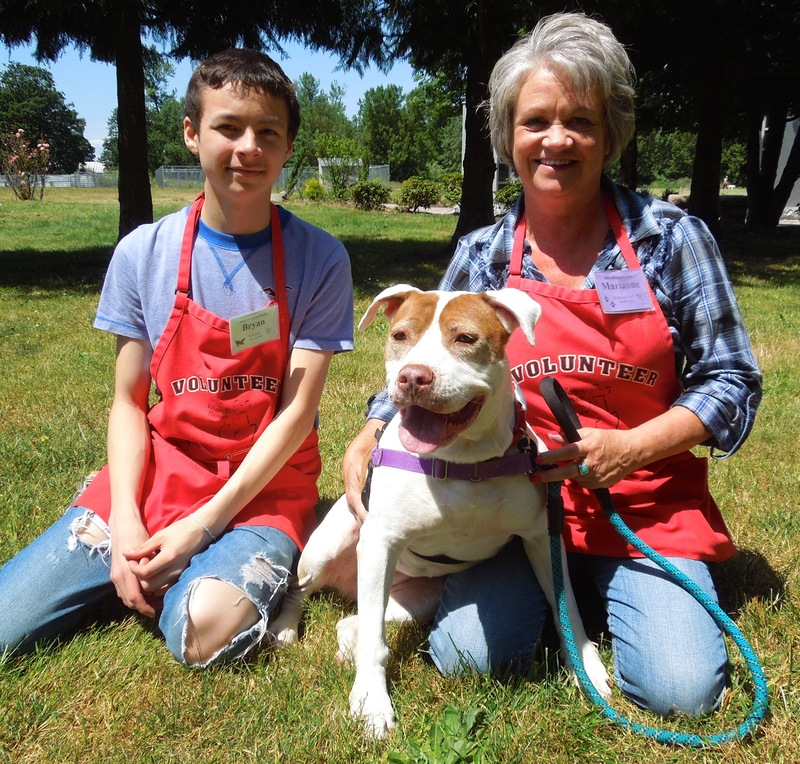 Here she is with volunteer Wendi. Still shy, but she loves to cuddle, especially if it includes a belly rub! 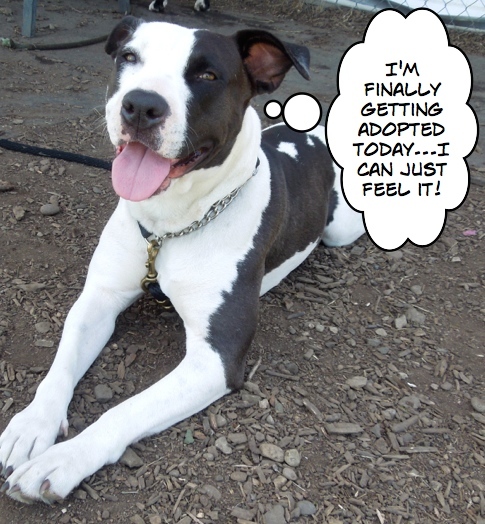 Roxy is a beautiful three-year-old Boxer/Pit Bull Terrier mix. Because she is so timid, her kennel presentation isn’t great. 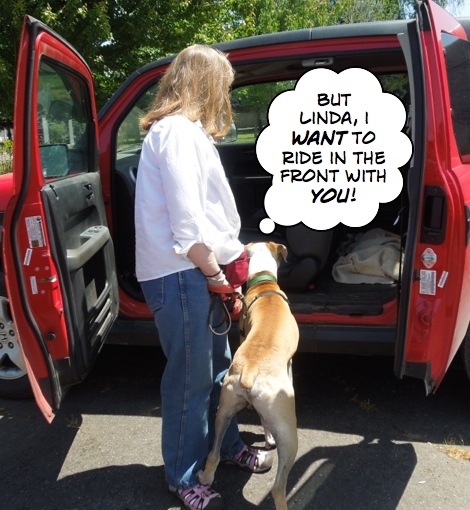 She tends to back away from the front when potential adopters approach. However, if they would just ask to take her outside, they would see what a loving dog she is. If you are a regular reader of my posts, you already know that Roxy is Emelynn’s favorite, and now one of Wendi’s, too. 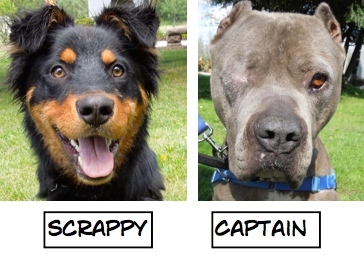 We’re all hoping a patient, loving, cat-free family will take her home soon! What a gem they will get! Nope, I’m not going to be here long, folks! 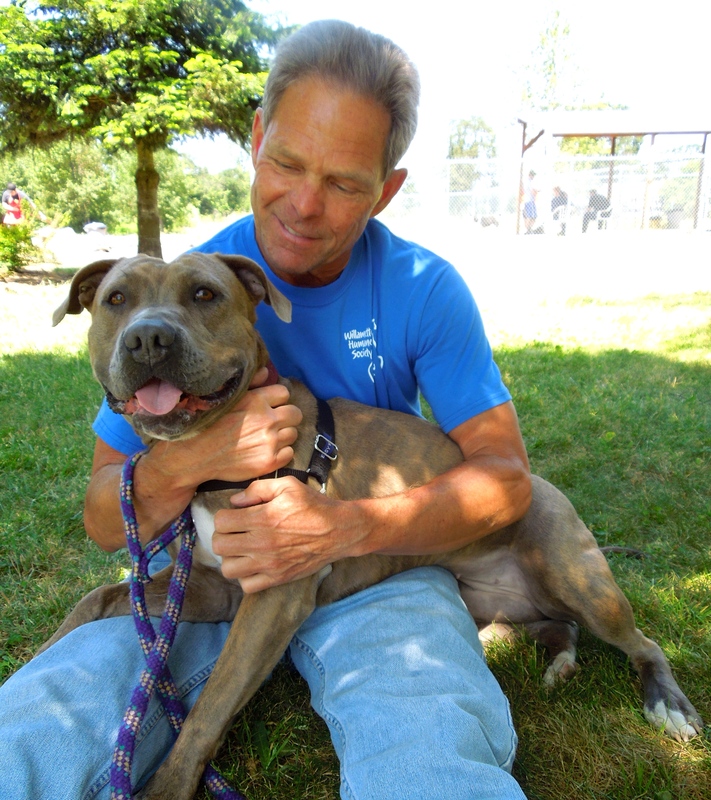 I met Athena for the first time on Sunday afternoon when Bruce brought her out for pictures, saying that she had just arrived at the shelter. 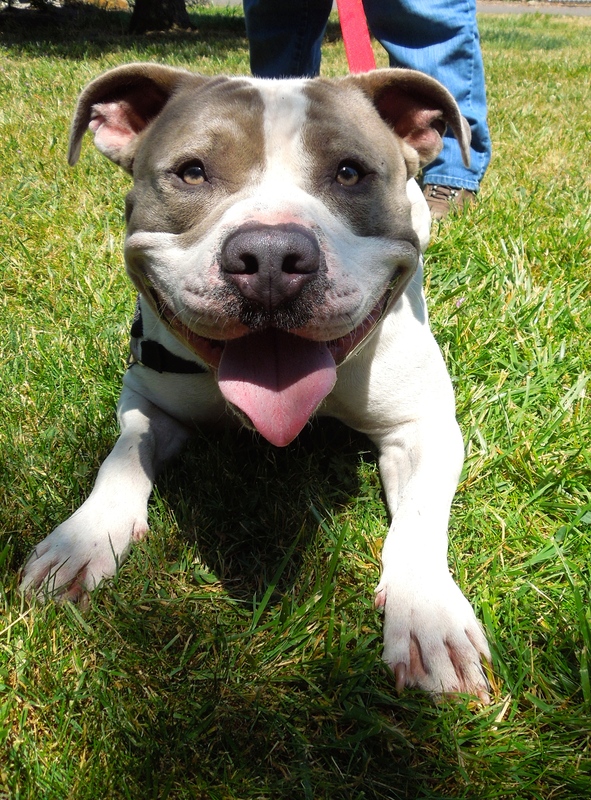 This one-year-old Pit Bull Terrier mix is a happy, enthusiastic girl. 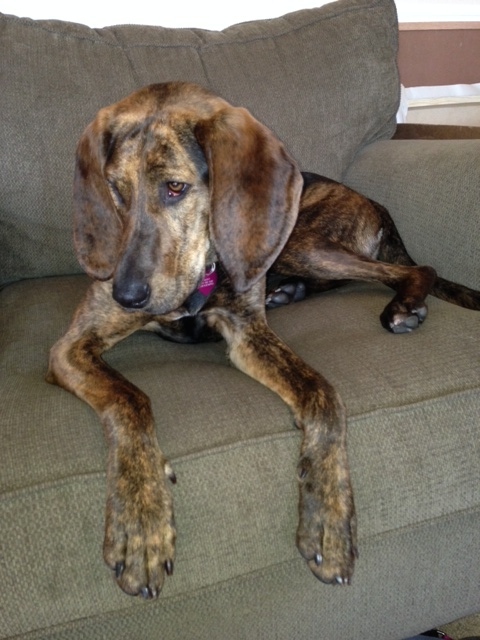 She is house-trained and loves to play with other dogs and kids. Not surprisingly, she had two “holds” on her by the end of the day. She’ll be going to a new home as soon as she is spayed. Lucky family! New here. Hope I’ll get a fresh start in a forever home very quickly! What a cutie little Trudy is! 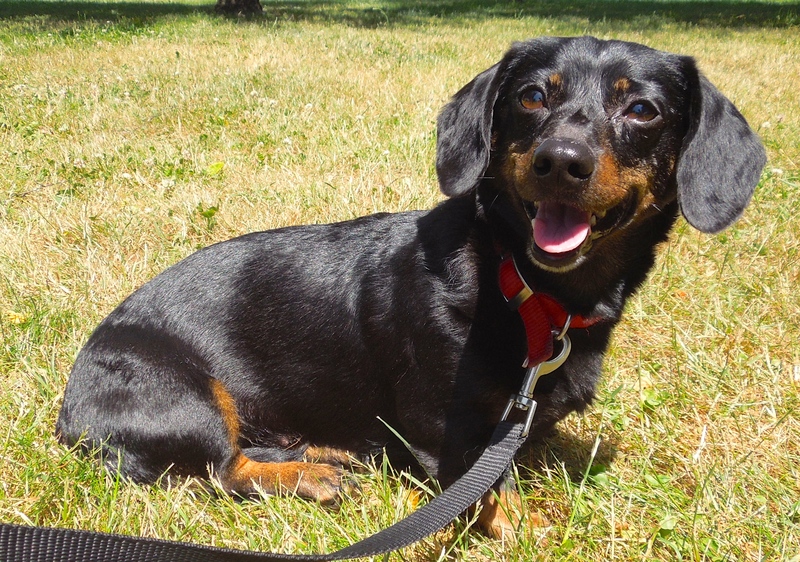 She’s a one-year-old Miniature Dachshund mix. She is a little shy around new people, but warms up once she feels secure. She has a great history with other dogs and even cats! She loves to have her belly scratched and enjoyed munching on my hot dog bits once she felt sure of me. Here she is with Jolene. She’s a keeper! Will THIS week be the start of my new life as your best friend? 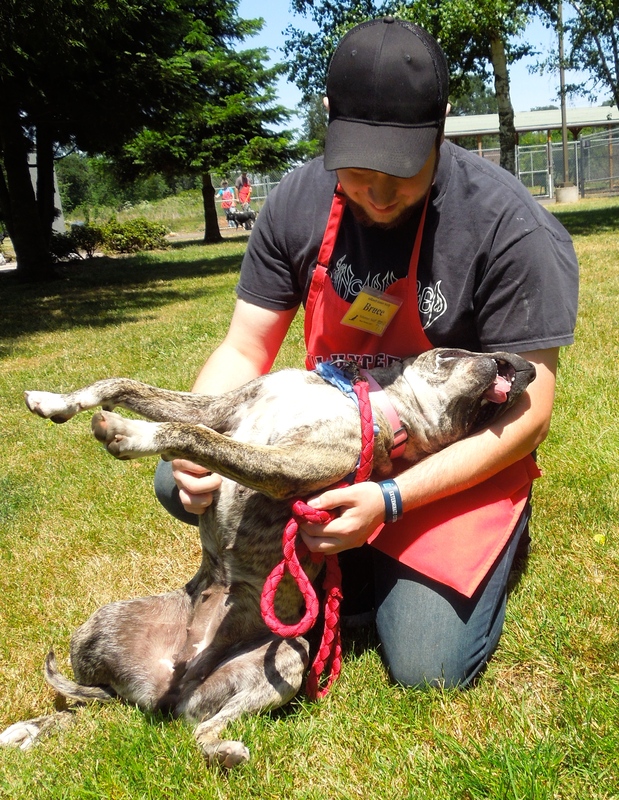 Lady is a regular in play groups and loves romping with her friends. She is hoping for a new home soon! Francis has become a great fan of this gal. Heard any good jokes lately? I’d like to add some to my One-Pup Show! Ever the jokester, giant puppy Sam, has gotten over his longing for his cart (see last week’s post) and has moved on to thinking he’s a stand-up comedian. Here he is with his latest. 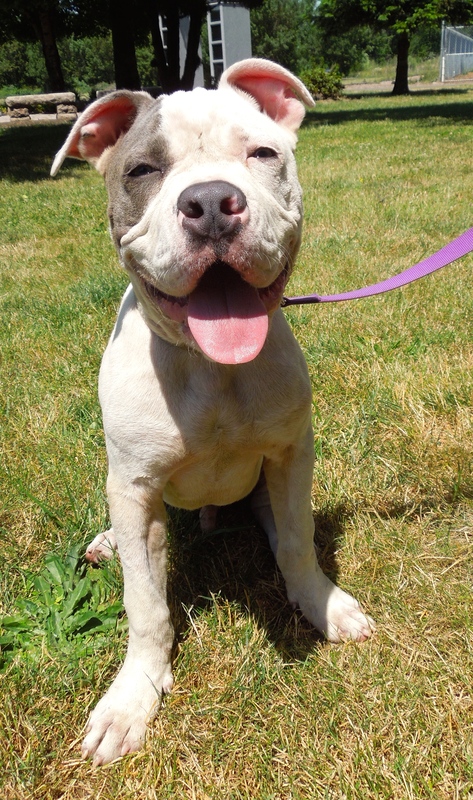 Sam is a five-month-old American Bull Dog mix. He is looking for a home without small children (he’s learning to be less mouthy, but isn’t perfect yet) and a family anxious to go to the puppy training classes that are included in his adoption package. 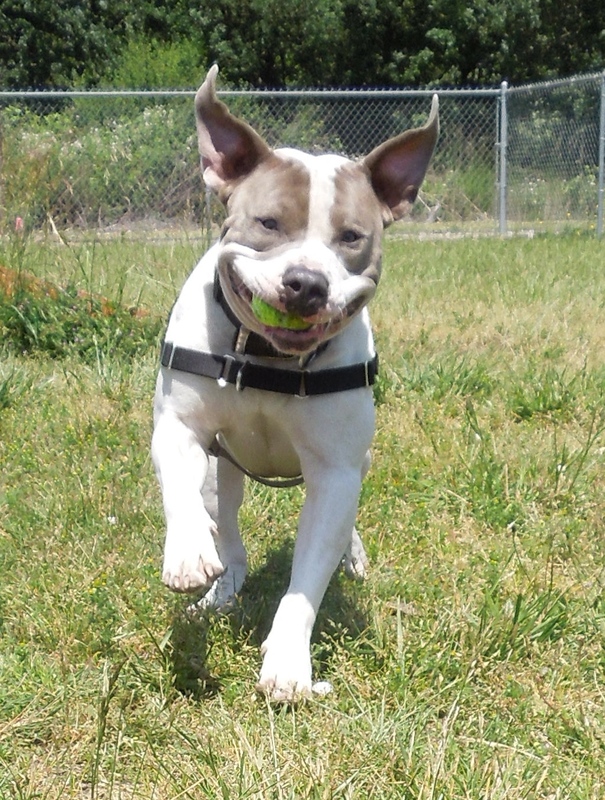 This boy has a great time romping with other dogs in play group and can’t wait to have a family of his very own. 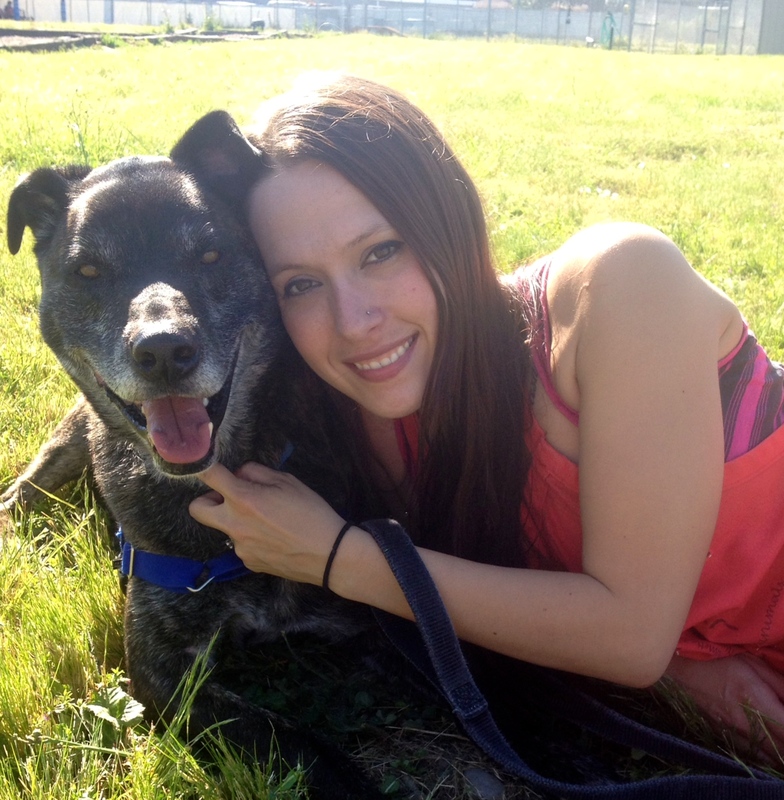 If you have a love of “seniors,” you need to meet me! Maybe it’s because my husband’s and my former shelter dog, Scout, is almost 14 years old, but I have a very soft spot in my heart for seniors. On Sunday I fell in love with Stella. Here she is this afternoon with volunteer Ian. She is ten years old and was found as a stray. She’s a Lab mix and such a sweetheart, calm and patient. I so hope she is adopted quickly. 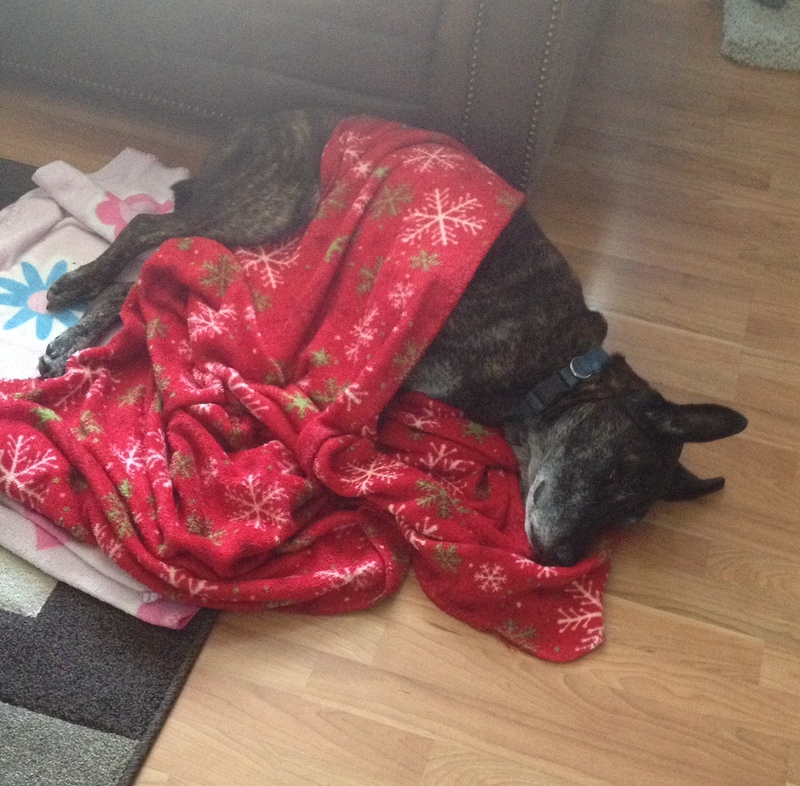 Shelter life is especially stressful for senior dogs. Speaking of “seniors,” don’t forget ME! 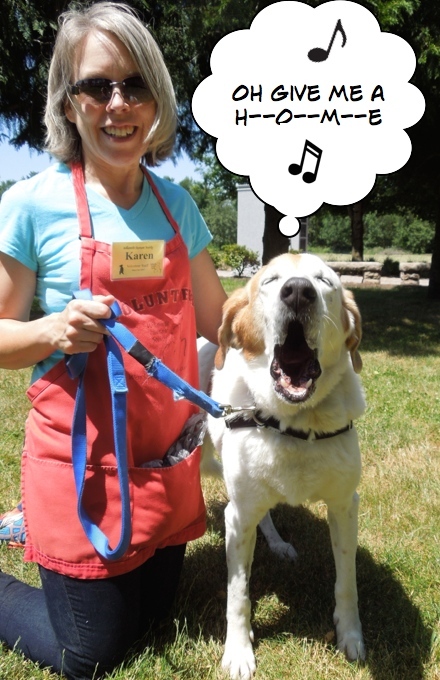 Oh yes, then there is Sawyer, a seven-year-old Hound mix who is such a great character! 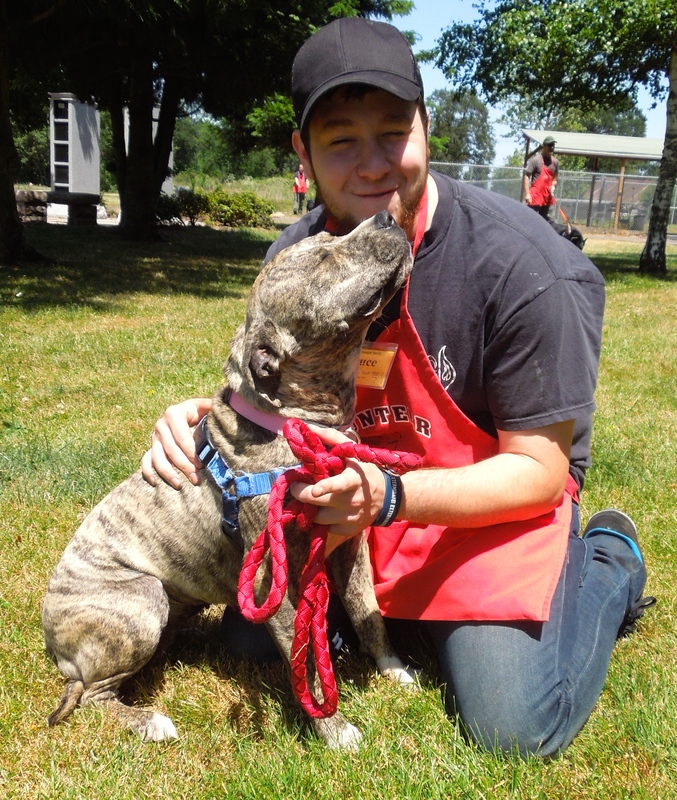 He loves to spend time with people as well as other dogs. 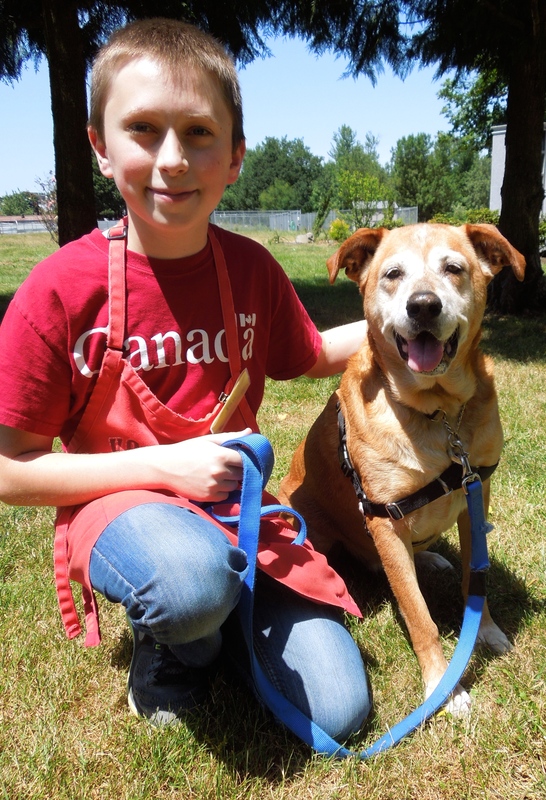 He is hoping for a new family who will love the facts that he is already house-trained, walks on leash well, likes children, and is an all-around great older gentleman. Karen enjoyed listening to him sing on Sunday. I’m Tank. Need I say more? Yes, his name says it all. 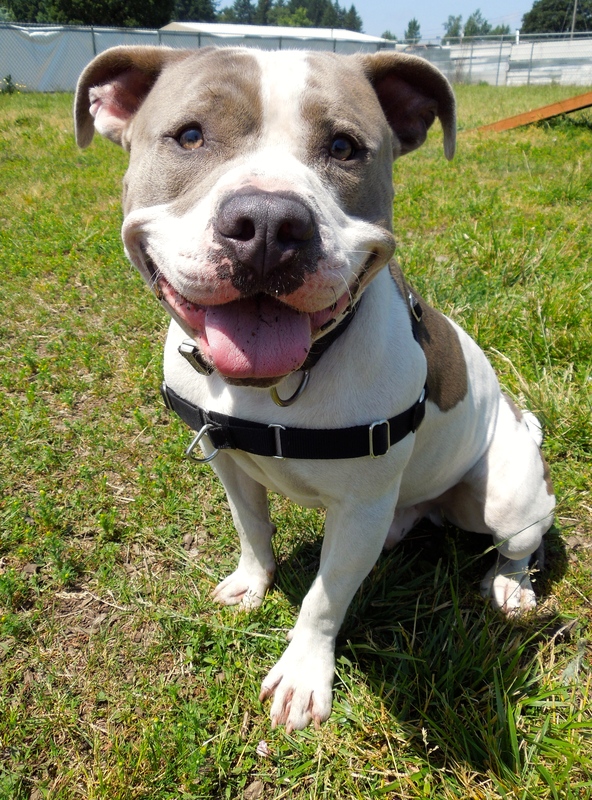 Tank is a one-year-old Pit Bull Terrier mix who is just that—a tank! At 70 pounds, this boy is ready to PLAY! 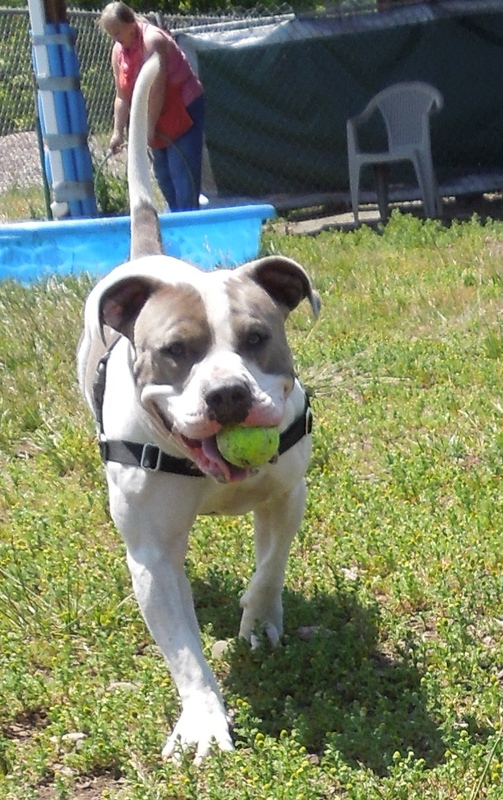 He is a total “Ball Dog.” He will play fetch as long as you will throw the ball and returns it to you very politely. He does need to work on polite leash-walking, but it’s all because he is so eager about EVERYTHING! 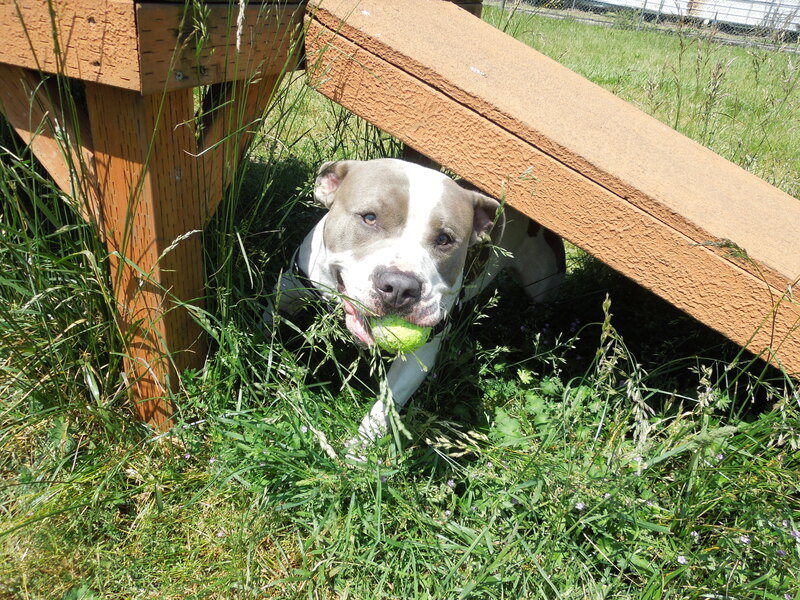 He has a wonderfully comic personality and will make a great family dog. Here are some pictures to show the many happy faces of Tank. Still here…but hoping to be “home” soon! 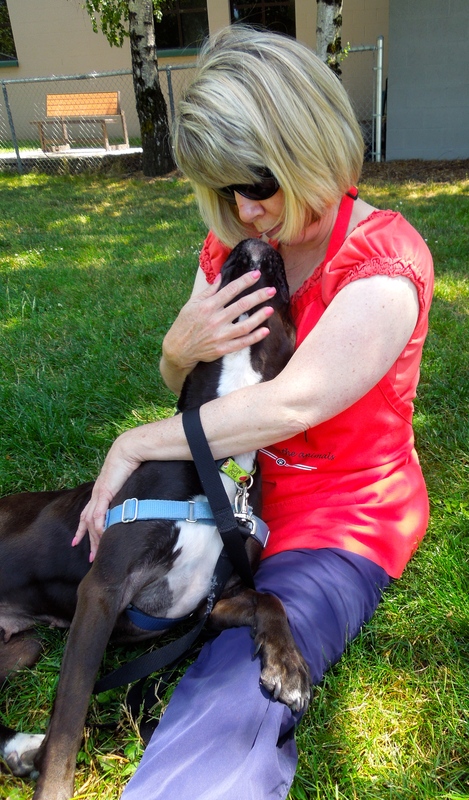 Marianne and Bryan spent time with sweet Sheila on Sunday afternoon. Sheila has been waiting for her new home since May 3rd. 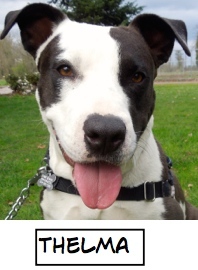 She’s a five-year-old Pit Bull Terrier mix. She is a S.T.A.R.T. 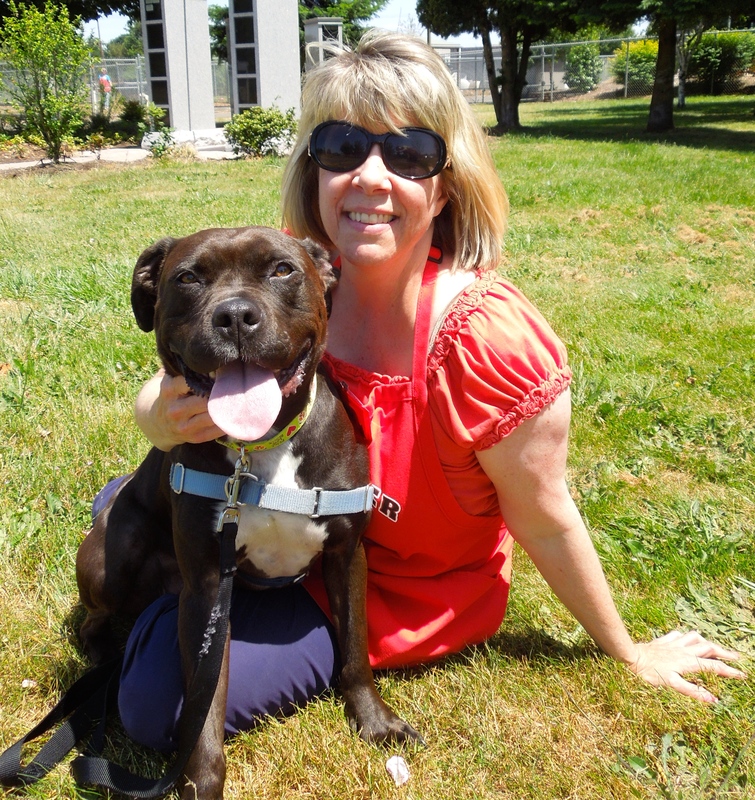 dog and before arriving at WHS, she was in a California shelter for five months and never adopted. I’m so hoping a family will fall in love with her as we have and make her an official Oregon dog! I got to go on a respite with Jolene! We had FUN! 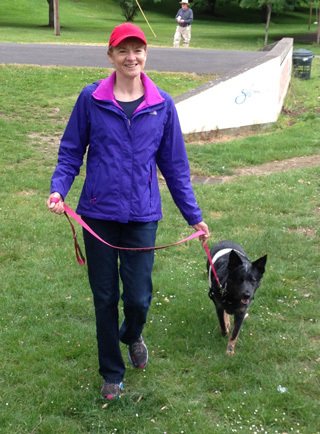 “Had a great time with Nicki at Bush Park this morning. 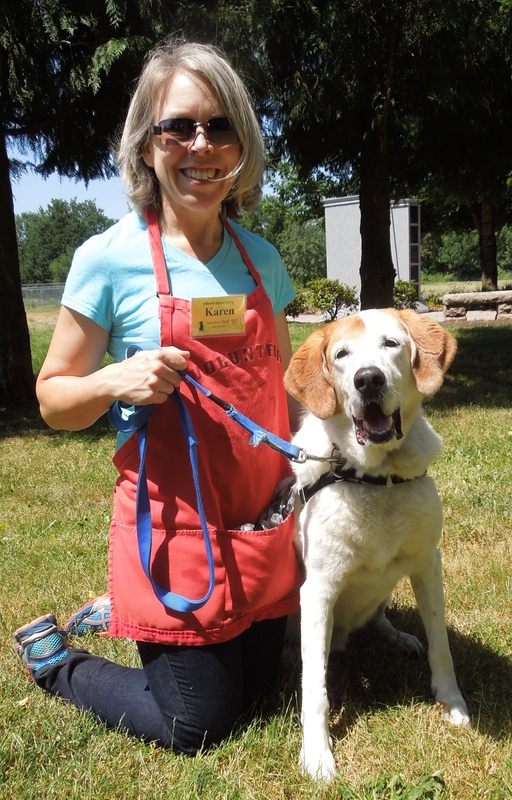 She is so polite, walks very well on leash, rides well in a car, takes treats so gently. The squirrels were really distracting for her, but a simple “leave it” and she moved on. Crazy baby squirrels were practically falling at our feet (they fall out of the trees, bounce up and climb back up the trees)! A jogger passed us and was laughing–said from a distance, all he saw was the stocky black body and white middle and thought I was walking a pig!!! We won’t tell Nicki he said that! You’ll remember that last week Chevy and Linda went on a test run to training class at My Dog’s Gym and that all went well. On Sunday afternoon they went for the real thing. I snapped a few pictures as they left. 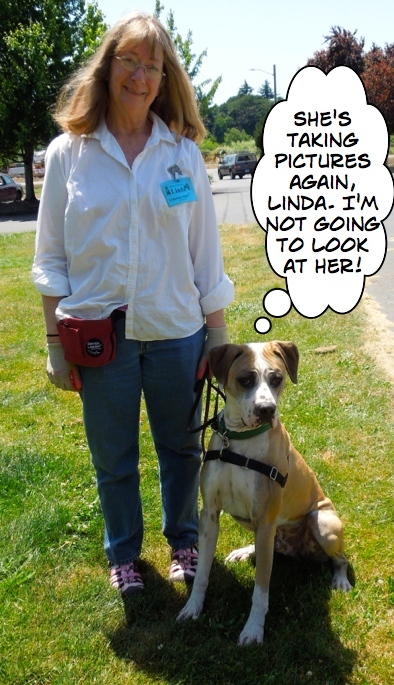 Linda reported today that he did GREAT in class and listened to instructions very well. He’ll have six weeks of classes (he won a scholarship through Fences For Fido) which can be transferred to his new owner if he gets adopted before they’re finished. 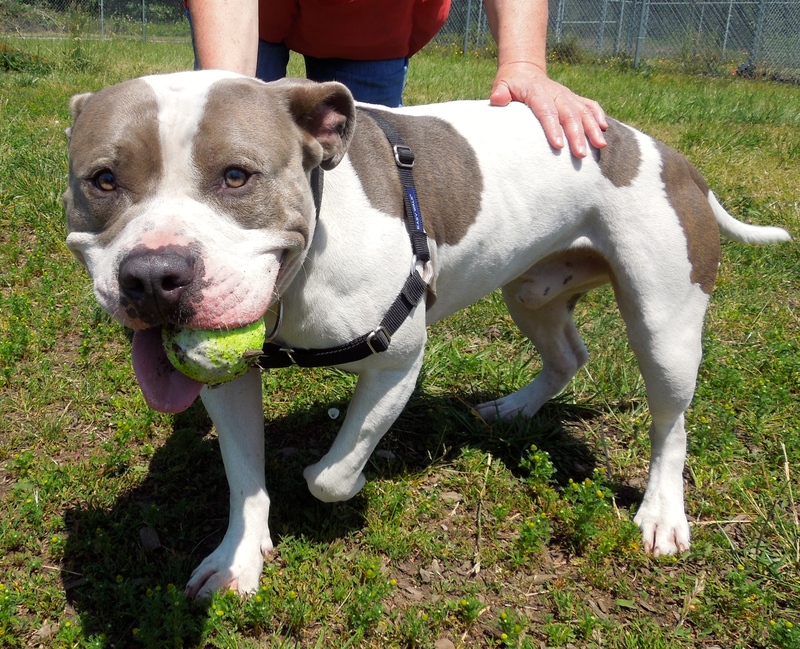 Chevy is a three-year-old Pit Bull Terrier/Boxer mix. He’ll need a very dog-savvy adult-only family. Chevy gets very tired of my wanting him to pose for pictures. There was a slight misunderstanding about where Chevy would be riding. 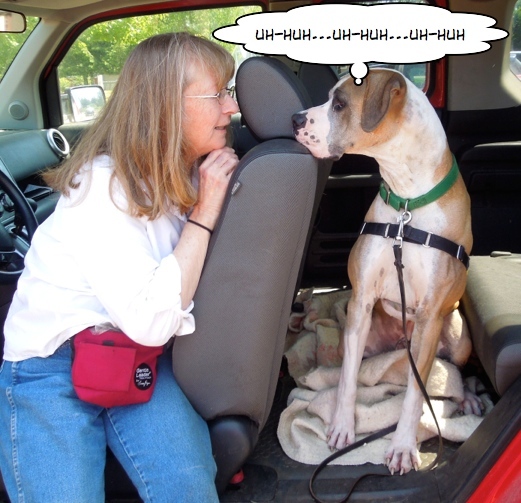 Linda explains her expectations for Chevy’s behavior during class. 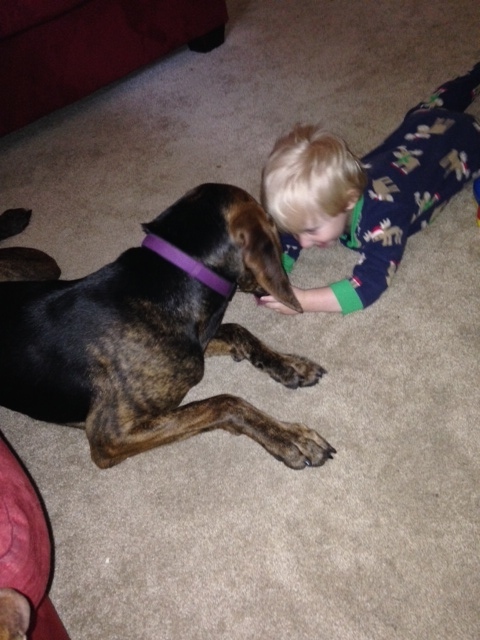 “Bailey is an amazing addition to our family. We are so glad that we didn’t pass this girl up based off of her activity level. Upon bringing her home, she immediately settled in and down. She enjoys playing ball, rolling around with her sister Daisy and her cousin Dexter. When she is not playing, she can be found watching the kids or relaxing in her favorite chair. She is very smart and treat-motivated so training her has been easy. We are just absolutely in love with her. Thanks so much for caring for this doll!!! Yep, Thelma’s new name is Roxy. Here’s the update I promised at the beginning of this post. “I wanted to give y’all an update on Thelma!! So this morning was a little rocky but by this evening she is really settling in and coming out of her shell. She loves kids and people so much. Also she has seen all 3 cats. 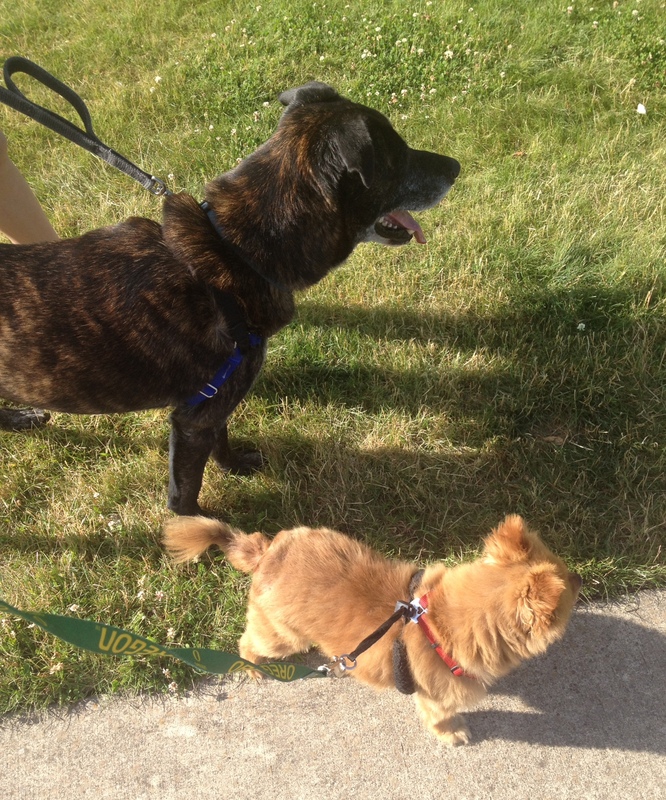 She has not chased she just barks, I’m pretty sure she has no idea what they are! She met Jasmine, (our orange wing Amazon parrot), she went up to sniff and Jazzy went for Thelma’s nose and now Thelma wants nothing to do with her. Wow! On those wonderful updates, I’ll close for this week! 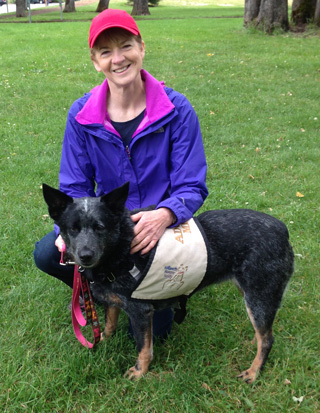 Happy news that Rodeo did well on his respite, thank you for taking the time with him and sharing with us. Nice to know that he got along with your little guy. Roxy is also one of my favorites and you are right, she is a love bug. 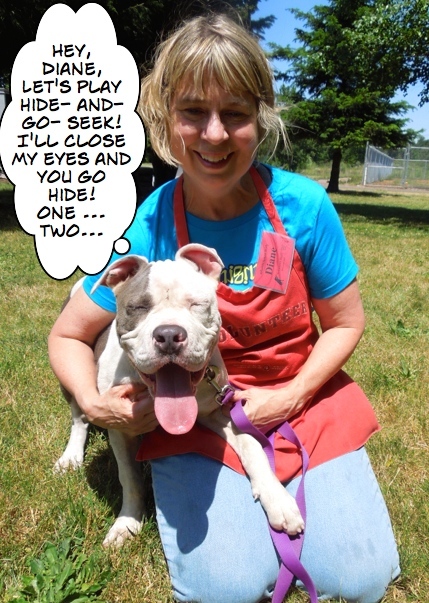 Lady/Janie is a nice girl too! 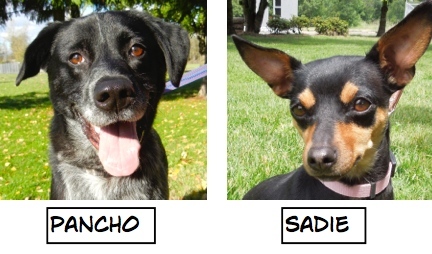 Ok Salem area, 3 great dogs to visit and maybe give a home to. Something for everybody. 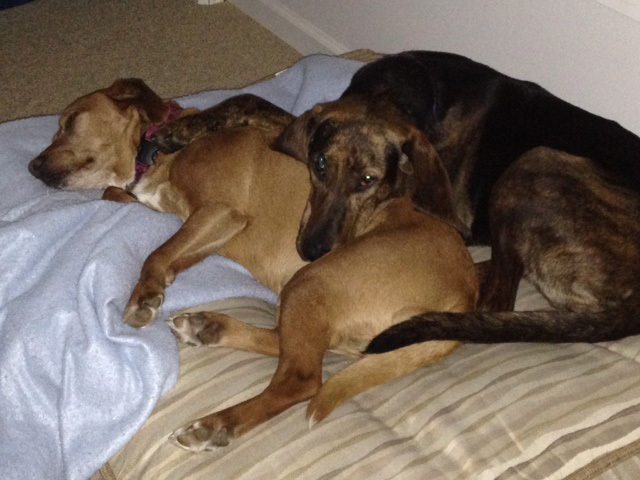 I love seeing pictures of a newly adopted dog already cuddling with it’s “home-mate” buddy. Can’t wait to hear updates on how Chevy does in ongoing classes. 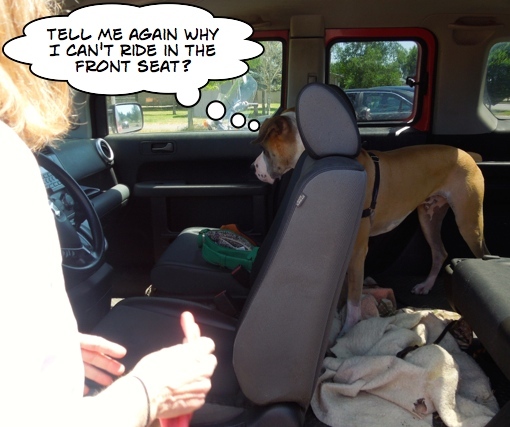 Looks like he was pretty well behaved in the car (better than in the kennel with all those barking dogs going by). 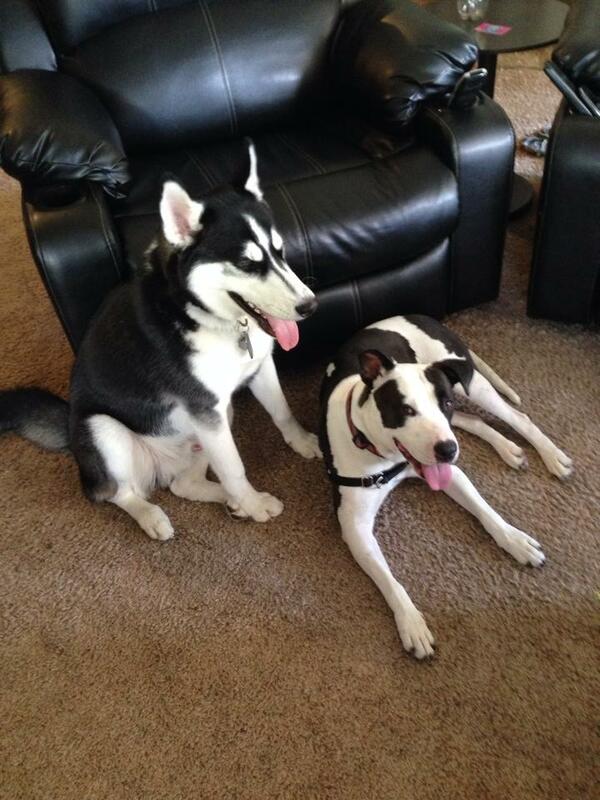 I think Roxy went home today; I am sure we will get an update next blog.